Jagan Institute of Management Studies (JIMS) situated at Rohini, Delhi is nowadays among the most preferred destinations for recruiters, looking for competent and reliable technical manpower. JIMS, which is celebrating its silver jubilee this year, has nurtured a large number of successful corporate executives such as Deepak Sood, Director, Barclay Capital; Kumar Nachiketa, Vice President, Deloitte; Pankaj Sikka, Associate Director, E&Y; Saurabh Goel, National Head, Hindustan Coca Cola; Kumar Digvijay Singh, Senior V.P., Yes Bank; Inderpeet Kaur, Country Head, Royal Bank of Scotland and many more. Success of JIMS’ alumni is largely due to the commitment, sincerity and integrity towards their work, which are imbibed in them right from their first day at JIMS. The bonding is so strong that alumni continue their association even after passing out from the institute. Vivek Singh Sidhu, (2008 batch), started his own animation film studio and is now a member of alumni association. Gaurav Vashisht (2006 batch), who is running his own E-Commerce venture regularly visits campus for mentoring the students. Such is the image and repute of the institute that every year over one hundred companies conduct placement process across different programmes. These include top ranking firms across sectors ranging from FMCG, Consumer durables, IT, Retail, BFSI and many more. 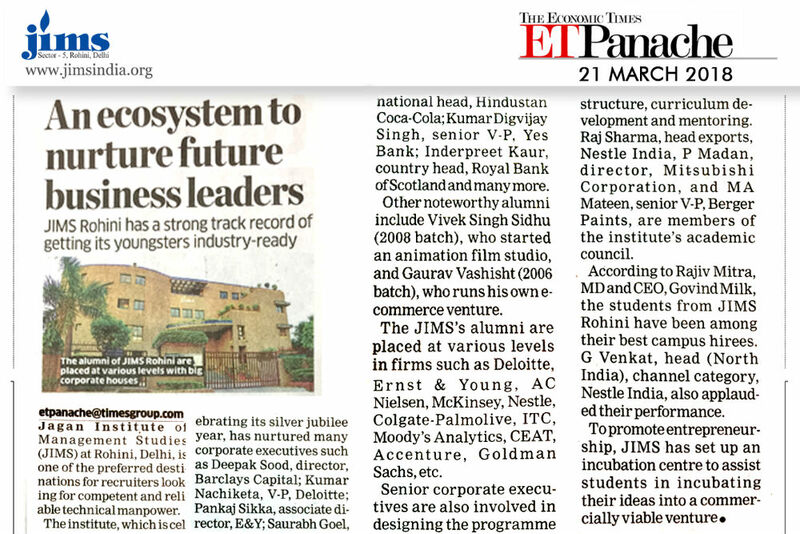 JIMS’ alumni are placed at different levels of hierarchy in firms such as Deloitte, EY, AC Nielsen, McKinsey, Nestle, Colgate Palmolive, ITC, Moody Analytics, Ceat, Accenture, Goldman Sach etc. Senior corporate executives are also involved in designing programme structure, curriculum development and mentoring. Mr.Raj Sharma, Head Exports-Nestle India, Mr.P.Madan, Director – Mitsubishi Corporation and Mr.M.A.Mateen, Sr.V.P.-Berger Paints are currently members of the Academic Council of the institute. Recruiters find JIMS students quickly employable with less training need and also reliable as their attrition rate is very low. According to Rajiv Mitra, MD and CEO, Govind Milk, the students recruited from JIMS, Rohini have proved to be among their best campus hires. G.Venkat, Head (North India), Channel Category, Nestle India also feels that Bonding between faculty and students is excellent, which is evident from the performance of students. JIMS also promotes entrepreneurship among its students. JIMS Incubation Centre has been set up to assist students in incubating their creative ideas into a commercially viable start-up venture. Many students even before the completion of their post-graduation have started working on their ideas under the guidance and support provided by the incubation centre.